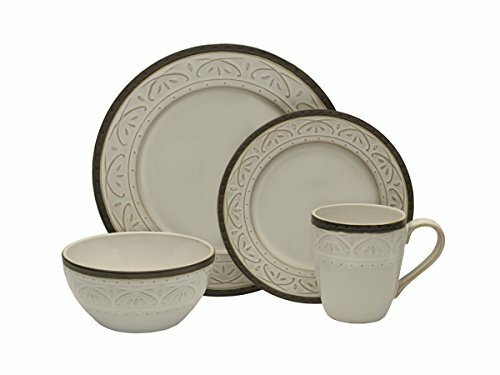 This Pfaltzgraff Promenade Scroll 16-Piece dinnerware set features a clean white center with scroll embossing and a thin metallic-like rim. The set is crafted from high quality stoneware for lasting beauty. This 16-Piece set features service for four and includes 4 of each: a 10-1/2 inch dinner plate, a 7-3/4 inch salad plate, a 6-inch bowl, and a 12- Ounce mug. The beautifully detailed design compliments any decor and is perfect for everyday use. Dishwasher and microwave safe. BEAUTIFUL DETAILS AND DESIGN: A delicate beaded accent borders either side of the rim, while a bold, earthy band of color frames each piece for a look that will make the place setting pop on your table.